At least its better than nothing. She struck the match and lit the wick, dropping the smoldering tinder onto a tin plate on the counter. With light in hand Heather went back to the parlor, constantly looking over her shoulder to cover her tracks. She wedged her feet back inside her shoes, tying them in a haphazard manner before reaching for the door handle. As soon as it clicked, the wind had blown it open, almost banging against the wall loudly. Heather struggled to hold it in place as she exited, pulling it closed before stepping off the porch. A few droplets hit her face, thankful for the absence of the torrential rain earlier. However the wind was still unforgiving, blowing her hair and skirts in a multitude of directions. She once more felt cold and vulnerable, a small pang of regret having to leave these nice people who invited her in. With one hand to keep her wayward dress in place, Heather stepped off the porch and into the road. Her footsteps faltered slightly from the mud as she began her voyage back to her house. Her heart rate had increased, feeling the constant thumping in her chest. Heather’s nervous eyes darted to the sides constantly, hoping that dreadful pair of eyes didn’t show themselves. Sometimes she thought she could hear something behind her, but she bit her tongue and steeled herself, promising not to look back. It was a several minutes before she arrived at the small shack at the top of the hill. It was run down, the grass tall and trash lying in the yard. A dim light could be seen in the window as she fearfully unlocked the door, stepping inside. Heather didn’t say anything at first, darkness greeting her except for the lone lamp at the dining table. A form could be seen sitting between the lamp and her, no features visible. She felt a pit in her stomach, her knees becoming weak. It was foolish thinking to believe that of all the times, he’d be gone this evening. “Father…?” she squeaked in a wavering voice. Heather took a step forward. “What’s that rustlin’ noise?” a deep voice asked. Heather froze completely as her father got up, turning around. The man had long brown hair and a long beard, clearly having a grizzly appearance. He was at least double her weight and towered over her a foot. Her voice was caught in her throat as he stepped forward, his rough features illuminated by her lantern. “Where’d you get them clothes? And that lamp! ?” He voice rose, almost to a shout. Heather was in tears, reeling from the shake. All she could do was sob, unable to give him an answer. She was completely at his mercy, powerless to resist or fight back. “What did I tell you? What did I tell you! ?” He was inches from her face screaming at the top of his lungs. “Father, no!” Heather managed to utter between sobs. His grasp squeezed her with untold pain, leaving her limp and helpless. Heather’s heart stopped at the sight of the crazed expression on her father’s face. She knew what was coming, what she had been fearing all evening. 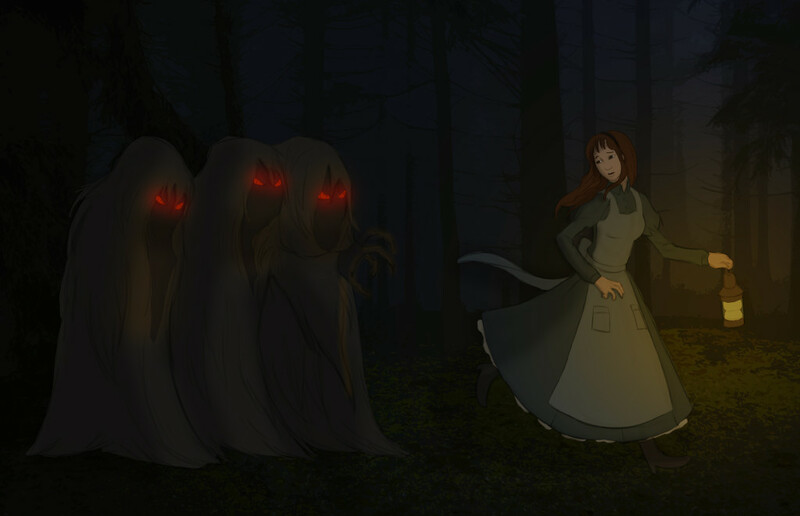 That thing that lurked in the woods, the same thing that sweet woman Elizabeth had encountered years ago. That monster with the red eyes. She tried to scream and pull herself away, receiving another shake and a slap in response. Heather collapsed to the floor from the blow, the lantern thrown across the floor. In an instant her father was gone, a tall hairy form emerging from a swirl of blackness a few feet away. Those nightmare red eyes glowed from its featureless face, a long claw-like hand reaching for her. Heather gasped and screamed, scrambling backwards and grabbing for the lantern. That’s all she had to defend herself. Her back met the wall as her hand frantically fished around for the top of the lantern, not daring to take her eyes off the hellish specter. Whispers filled her ears, loud an unintelligible. Heather knew covering her ears were no use, her hand finally finding the ring on top of the borrowed light source. She slowly struggled to her feet, unsure of what her next step would be. Her hand fumbled and groped for the door in a vain attempt to escape. A faint sliver of hope sunk into her mind; Elizabeth’s story of her encounter. She survived and she was able to escape it. The sight of the lantern caused the thing to freeze, the red eyes narrowing. Its hand just hung there, a foot away from her. 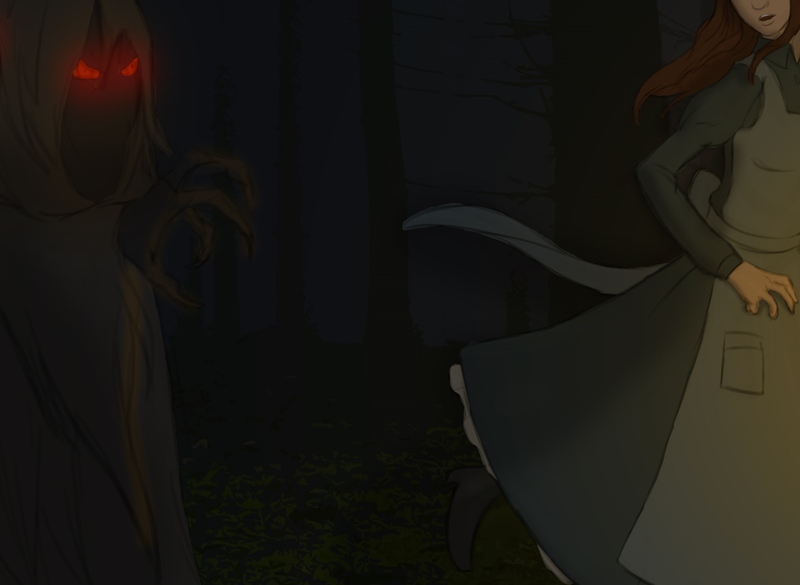 She shakily stretched the lantern forward, watching as the monster withdrew its hand and backed up a little. It wasn’t pleased. Despite no mouth visible, a banshee-like scream pierced the night. Heather could swear her eardrums were bleeding as she watched the roof fly off the house. The monster’s head was tilted upwards, continuing its scream. She felt the walls start to break apart as she pushed on the door the best she could, stumbling out of the collapsing inferno just in time. All that was in her mind was to escape. At first she didn’t know where she was going to escape to, but that issue was resolved quite quickly. Heather turned to run back towards Elizabeth’s house. She had barely started when the whispering filled her ears again. Between the jumble of nonsense she struggled to keep her footsteps as she started to flee the scene. Heather dared to look over her shoulder, seeing three of the creatures lined up next to each other. More had started to emerge from the woods in her direction. She recognized the first creature in the center of them all, claws still outstretched. Her father was nowhere to be seen. Her ankles locked as she could feel the same pain in her chest that she did earlier, partially losing her footing. She tried to ignore it, focusing on the feelings she had experienced earlier in the night. The feelings she had battled with to embrace, so she wouldn’t experience the pain she was feeling now. Heather focused straight ahead, tearing down the muddy road as fast as her legs would carry her. She did exactly what Elizabeth did, never looking once behind her and never stopping. As soon as she saw Elizabeth’s home, Heather felt with some certainty that she would see another day. She ran against the door, pounding on it with her fists. “Elizabeth!” She cried. She pounded as hard as she could, repeating the woman’s name. Within a minute the door opened, Elizabeth in a long white nightgown and a candle in her hand. Upon seeing Heather her faced filled with utmost concern, letting the poor girl stumble in. Heather collapsed against Elizabeth, sobbing into her shoulder. Elizabeth carefully took the lantern out of her grasp, setting it aside. She held the girl for a moment, waiting for her crying to subside. When it didn’t, Elizabeth stroked her hair, embracing the girl in a comforting manner. Heather attempted to swallow, shuddering in cold sweat and looking up at Elizabeth. “Don’t let them hurt me.” She tried to hold onto Elizabeth tightly, drawing whatever consolation she could. Bleeding? Heather looked down in confusion. Right in the middle of her chest was a dark red bloodstain. She didn’t know how to answer, her lips wavering in confusion. “Mom, you found her!” Janus had just entered though the front door, Tau’mi behind him. Both were still dressed in their dayclothes, although they were missing their shoes. “Kids, come inside and close the door.” Elizabeth was clearly concerned. Heather turned to answer, her eyes gazing out the door one last time. Her body froze as she caught one last glimpse of several pairs of eyes in the forest before Janus had closed the door. The toll of everything had caught up with her. Heather convulsed in shock as her eyes closed, slumping against Elizabeth. Everyone gasped and huddled around her. “She okay? !” Tau’mi tried to rouse the unconscious girl. “It looks like she fainted. Let’s get her off the floor.” Elizabeth motioned to Tau’mi, standing to her feet. The two women carried Heather upstairs, Janus snuffing out the lamp that the girl had taken and placing it back near the cellar. He started up the stairs himself, almost sure that his mother would send him off to bed. He couldn’t comprehend what had happened to the girl, and though he wasn’t too concerned, was worried about Tau’mi. She was very worried about her friend.